It's not often that we play a video game designed, coded and scored in just five days. Canabalt, conceived and created for the Experimental Gameplay Project, uncomplicated as it is, somehow doesn't feel like the typical output of two weekends. 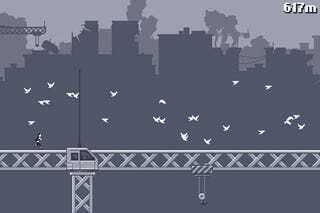 Canabalt is a game of escape, a simple, one-action platformer that—from a gameplay perspective—is little more than careful jumping, an accelerated sprint across rooftops, through windows and over tower cranes. As the highwater pants-wearing star of Canabalt, a black and white escapee with impressive stamina, players must avoid obstacles that can slow their sprint and bombs that will turn them into a fine mist as they run away from... something. Players must also avoid running face first into a wall and plummeting to their death. The Best Graphics Six Colors Can Buy: Canabalt's minimal graphics don't skimp on atmosphere. From the smoothly animated runner, to the hulking monstrosities in the distant background, to the little touches, like the shatter of windows and rooftops lined with doves, the game's simple presentation does well in telling a more interesting story. There's no narrative to speak of, but Canabalt's high-altitude world gives an impression of a fascinating sci-fi disaster happening around you. The Maximum Awesome Effect: The iPhone version of the game prefaces the experience with "For maximum awesome, headphones recommended." That's good advice, because Canabalt's attention to detail in the sound department deserves proper attention. When the game's catchy, high energy electronic soundtrack takes a pause and turns to a moody whine, the player can hear the plink of footsteps on metal, the quiet grunts of the protagonist's exertion as he jumps from building to building. The sudden sounds of bombs dropping and alien ships zooming by make the rooftop-to-rooftop action that much more tension filled. Canabalt simply sounds spectacular. Gaming By The Minute: The Flash game is a fine distraction from doing real work. The nearly identical iPhone app is just as addictive of a diversion, offering two-minutes and under opportunities to play a video game, a brief opportunity to improve one's Canabalt run—then brag about their score on Twitter—when the moment strikes. Canabalt's a straightforward, simple action game with an impressive presentation that belies its hasty creation. It's incredibly short and offers no ultimate goal other than extending the length of your daring escape. And despite its brevity and its sometimes frustrating randomness, it's the iPhone game I've dedicated the most time to in 2009 due to its incredibly addictive appeal and sharp visual design. There's always another escape attempt, just a tap (or click) away.